How can cities use their property investments to reboot the high street? Access to cheap borrowing has encouraged local authorities to invest in commercial property. Cities can use this approach to revive city centres, but only by diversifying away from retail. Access to cheap borrowing has encouraged local authorities to proactively invest in commercial property. These assets can be a valuable tool for cities looking to improve the built environment they offer businesses and residents. Councils are estimated to have spent £3.8 billion on property between 2013 and 2017, funded through the Government’s Public Works Loan Board (PWLB) at very low interest rates. Offices accounted for half of this investment, and roughly a third (£1.2 billion) has been spent on retail properties. And local authorities were the biggest investor group for UK shopping centres in the first quarter of 2018. There are two major motivations behind these investments. First, at a time when cuts are squeezing council revenue budgets, property investments can provide a long-term revenue stream to keep quality public services up and running. Second, ownership of buildings in areas marked for redevelopment allows councils to assemble land more easily and gives them more influence over the changes taking place, allowing them to make sure the space evolves to meet their objectives. But how exactly can cities turn property ownership into successful place-making? How should they adapt the buildings they invest in to improve the performance of the economies? When developing the city’s property offer, the aim should be to get jobs back into the city centre while reducing the dominance of retail space. For councils who have invested in existing retail space and shopping centres, in particular, the temptation may be to try and retain their existing use, with new retail strategies designed to reduce vacancies. But as our Building Blocks report illustrates, the evidence points to this being a dead-end. Instead, cities may need to convert the properties they own so they house a more diverse group of businesses. Many city centres already have a lot of retail, and this has not offered significant economic benefit. 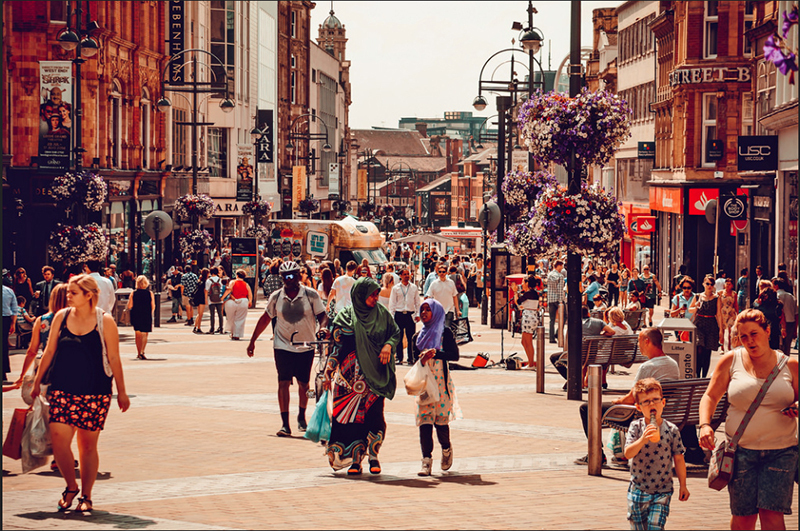 Almost half (43 per cent) of city centre space in the weakest city economies is taken up by shops, while retail only accounts for 18 per cent of space in strong city centre economies. And many of these shops lie empty: in weaker city centres vacancy rates of high-street services (retail, food and leisure) are on average 16 per cent, compared with 9 per cent in stronger city economies. In Newport, nearly a quarter of these premises are empty, as the map below shows. The big issue in these city centres is the lack of office jobs which are an important contributor to footfall for retailers. 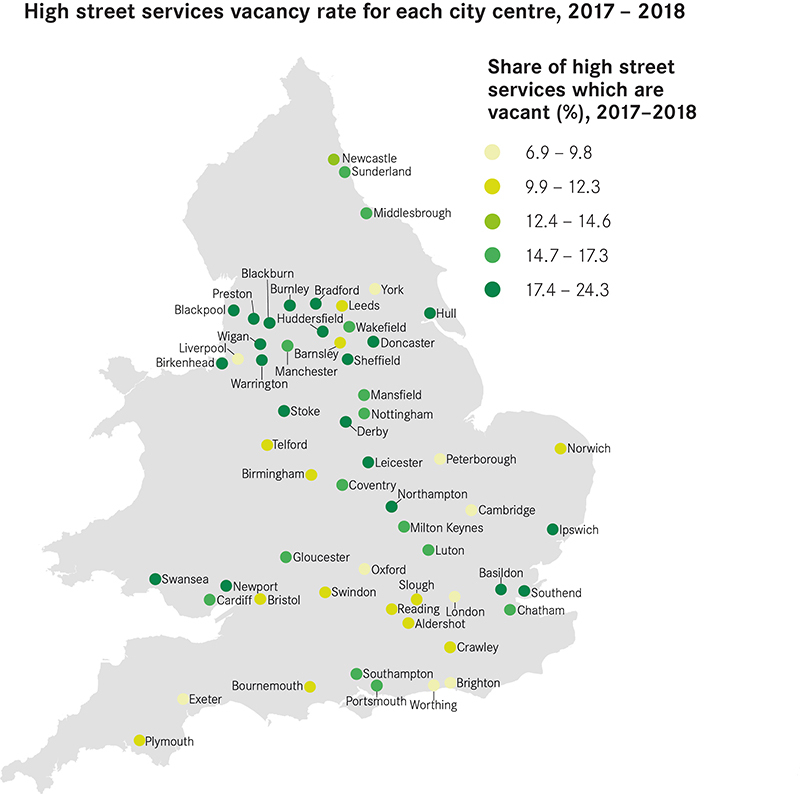 This means that in order to improve the fortunes of the high street, policy will need to tackle the barriers that deter those businesses from moving to their city centres. One of these barriers is the quality of office space. In a number of struggling city centres, the quality of office space on offer is poor. But the low returns available for private investors mean that some form of public sector involvement will be required. Ownership of buildings gives cities the opportunity to reshape the type of commercial space on offer. Some of this will involve improving the existing office stock available, some will involve converting retail to office, and some of will require demolishing part of the space without replacing it, in the short term at least. Without ownership of the land and buildings on it, this task becomes very difficult to do but will be a fundamental part of turning the fortunes of a city centre around. Cheap borrowing has provided a way not only for local authorities to generate an income stream through property investment but also opens up the opportunity to have greater control over the development of their city centres. For those choosing to invest, the focus must be on using ownership to make the city centre a more attractive place for all businesses to invest, rather than hoping to revive retail alone. Local authority investment is not always buying assets within their own area if they assets are bought for income. It is as likely that Sunderland will seek to invest in a high yield area in the South East as in its own town centre. The need to make a return over PWLB drives this, rational, behaviour. At the same time taking out tired and no longer fit for purpose retail to deliver new commercial space that is attractive to 21st Century businesses, blurring divisions between use classes is the way forward. Overhangs of very cheap (but unlettable) commercial space can preclude any speculative investment because the returns are apparently non-existent. An option may be for the Council to acquire and hold the assets, aiming for capital growth then work with a third party to develop meantime and then long term uses as described. This could be a tie up with a university, business start up agency or as in Folkestone and Eccles a local philanthropist. Very interesting work – both this blog and the Building Blocks report. For York, which is something of an outlier in your data (together with Cambridge – the two cities have the lowest vacancy rates, but not the mix of retail/office that you highlight), our city centre retail offer is driven by tourism, rather than office occupiers. We are buying retail premises, and will be keeping them as retail! The tourism/visitor economy angle may be something you need to look at alongside the mix of property types.